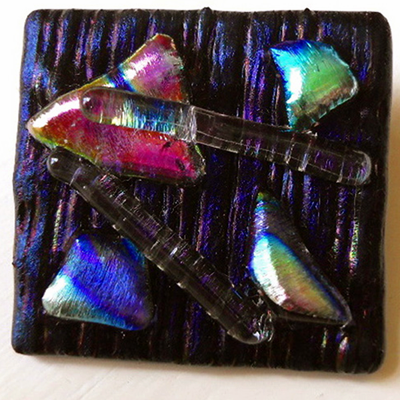 Brooches : Abstract design dark Purple fused Dichroic glass brooch. It measures 3cm x 3cm and is made of two layers of glass. A layer of dark Purple textured Dichroic glass and a layer of six different sized pieces of Dichroic glass arranged in an abstract design and all fused together. It has a very strong pin at the back and comes in a Black gift or Silver card gift box.